"Motorcyclists, propoably more than owners of other types of roadgoing vehicles seek knowledge about what, very litterally, makes their wheels go round. They are in general insistant upon having their machines, their motorcycles, sport or touring in top-notch condition, wheter this is for the purpose of competing in sports or for the sake of ordinary road use." How come our motorcyclist ancestors where so keen on getting to know all technical issues involved in the construction, operation and maintanace of their motorcycles? 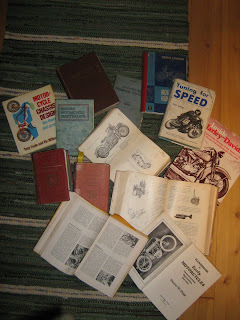 They had since the very early years after the birth of the motorcycle accsess to books impressively thick filled with technically thoroughness on the matter. Is this the case today? Does the average Joe motorcyclist care on any of the above matters? Victor W. Page wrote a 500 page book filled with technical know how for the motorcyclist in 1913, fully illustrated with hand drawn sketches. Bernard Osborne use the first 29 pages of his book to explain the essentials in how to use and care for files and other tools essential for the motorcyclist (like a sharp chisel!!). Does your files lay all stacked in a shelf rather than beeing hung up individually? If you followed Bernards instructions you would know what to do and not. Needless to say, I love those old books cramped full of information relevant still. 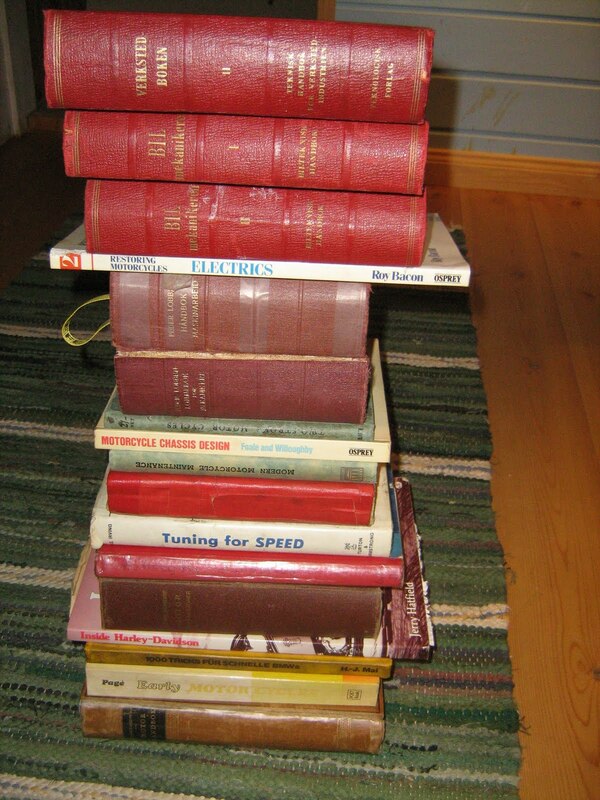 My favorite, Peder Lobben`s pocket handbook for the Mechanic vol. 1 & 2 counts 991 + 1196 pages. HOW big pockets did the mechanics have back in the late 1890`s when this giant was first published??? 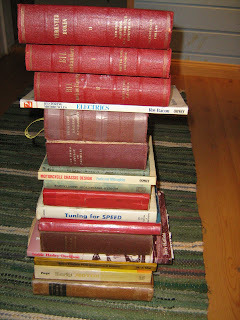 Search for those old books and read them, you will never regret. I own a 78 Honda and a 2006 BMW - I do work on both. I'll tell you this right now, I'd rather work on the old one any day of the week. The new one is way too clever and hard to get at. Still, I want to know what's going on inside there, it's compulsive, but I've got to know what's happening. Brady, having read some on your blog i agree with you that a BMW F 650 is "to easy to ride" as well as what you state its harder to get at from an technical point of view than older bikes. I`m to be working on my GF`s BMW 650 CS this winter, dont know if I`m looking forward to that or not. Ahhh, my bible is my Parts and labor manual. I refer to it often during the year. Well worth the 75 American bucks I paid for it. Chessie, as always thanks for comment. I got your point here, I might have something to learn?